We, who are committed to children, who listen to kids and are inspired by students realize: ALL Children Get Ahead, when the classroom is a positive, socially just community. ALL Children Get Ahead, when all their needs are considered and their beings are valued. ALL Children Get Ahead, when they are allowed to be who they are and discover what they want to become. ALL Children Get Ahead, when they are challenged and engaged, while being nurtured and encouraged. Hot Links - Delicious websites to feed hungry young minds. The left margin of this blog is entitled "Internet Integration in the Classroom" and it is composed of a number of great educational websites. The problem is there are so many links, the type face is small and its not easy to understand how the entries have been organized. To help you find what you are looking for, I am going to list the very best of my suggestions here, with a brief description of what you and your child will find at the websites. By the way, you might find some sites require you to update your Flash or Shockwave software, its free, safe and worth doing. Once installed the updates enhances how the activities perform and your child's enjoyment of them. One final thought, the younger the student the more assistance you will need to provide. A portal is a starting place or entrance, if you have a specific content area you want to work on with your child this is a good place to begin. The content areas are aligned with standards for the different grade levels allowing you focus on specific skills to practice or investigate. By the way parents, if you feel you want to brush up on your computer skills you might want to have a look at the on-line tutorials. When mathematics drills are fun they take on the energy of a game. 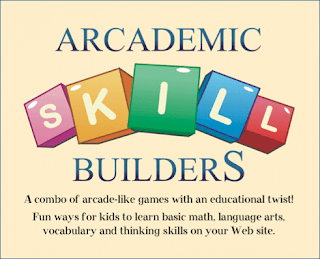 This website offers activities that foster mastery of fundamental math facts. They also have a number of great language arts activities as well. Interactive painting site that is easy to navigate, save, email and use. The site incorporates a feature that allows the artist to frame their work and observe it along side the works of other artists, which is really cool. Its Free, its Fun and it really helps students learn how to type. There are many keyboarding alternatives on the internet, which you'll find in older posts. In the meantime, after students have mastered the basics, they can have fun testing their new found skills at FREE TYPING GAMES. This is a well designed site for the student who is interested in science but doesn't have a specific area they want to research. The site puts fourth basic concepts using interactive activities which include sound. You enter the site through ages 5-6 or 7-8 and then you have choices listed in the right hand margin that are appropriate for older students. students can't seem to get enough of this site. Had this site not been blocked by the SMMUSD internet filters, it probably would have been the most popular student math site. The site has games in its description, so students couldn't get to it at school. The site has links to some Oswego Games, Fun Brain, Learning Planet , iknowthat and many others. It is worth a visit as they suggest other sites in other subject areas as well. Props to Fayetteville Intermediate School for putting all these well designed activities on one page. Students through out the school year have demonstrated great enthusiasm about the activities found on this page. The activities support teaching as well as practice and address the needs of grades 1 -5. If you don't have this program on your computer, download it now for free! Google Earth allows your child to explore both the earth, the sky and the sea. It isn't the easiest program to use at first (unless you view the tutorial) , primarily because of its many features, but the more you explore the easier it gets. Try using it to plan a vacation, visit friends in foreign places (does that include Big Fork, Mt?) or just find out more about our spectacular state. If you choose not to down load the program you can always use Google Maps. If a student is going to have to spend time learning their states, not to mention the continents, then they should have fun doing so and this National Geographic Kids encourages them to do just that. A third grade, Spanish speaking student, asked me to locate a website that might help her learn another language. I assumed she meant English, which she speaks, writes and reads rather well, so I suggested Pumarosa, but I was wrong. She wants to learn another language and having used the BBC for Math, Typing and Science I am confident they will handle language in a similar manner, hence my recommendation. Whatever your taste in fine art, be it classical to modern, realism or abstract, this site has an activity that will engage your child. Well worth a visit. As someone who is not schooled in classical music, I was excited to find a site that could enrich my understanding and appreciation. I believe parents and children alike will appreciate what they'll uncover on this website. The developers of this site call it "the Amusement Park on the Web" and it lives up to the hype. Your child can find links to many of the most popular kids sites on the internet all at one location (ie: Neopets, Club Penguin, Webkinz). While at the same time, there are links to some worthwhile educational fun sites including Discovery Kids, Professor Garfield, BBC's Bitesize Revision, Fun School as well as MANY others. This site was not created for elementary age students,it contains work that might offend some people's sensibilities, younger students should be accompanied by an adult. Having said that, if a student can type they can make movies, this site encourages writing in a way few other sites can. This site was not created for elementary age students,it contains work that might offend some people's sensibilities and takes some time to master. Understanding that, this site gives the student the ability to create animated shorts and work in a 21st century medium. I have been amazed at the work of our students on this site. I'm told this site is a collaboration between M.I.T. and U.C.L.A., resulting in a playground for future game designers, your kids. Students have an opportunity to create their own schemes and try the work of others. Once again, another site that takes some time to master but, it is worth the effort. The site gives adults a chance to see the future of gaming through the eyes of students. Another really popular activity on the computer is creating music in Garage Band (found on most Apple computers). This site allows any student with a desire to experiment to do just that online. Though we never used this site in the classroom, it is definitely something students are interested in and a manner of creativity that will become more common place in the near future. Want to create a Rubric?